These are all questions, among many others, I’ve been asked a countless number of times after introducing myself. The name Shelby, though not terribly obscure, will not appear on a “Top Baby Names” list of any year…ever. But does that matter? What’s in a name anyway? As a person with a unique name, however, I figure it’s only right I focus my own deep dive here. So, what makes a name unique? In the case of our analysis, spelling plays a big role because a different spelling means a different name. For example, Emily and Emely are counted as two different names even though they’re pronounced the same way. 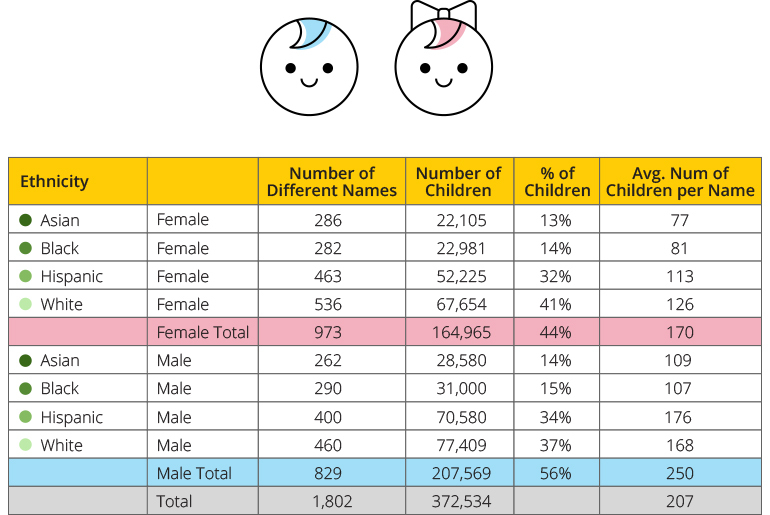 On top of this, fewer children per name mean more names overall, which in turn means more unique names. 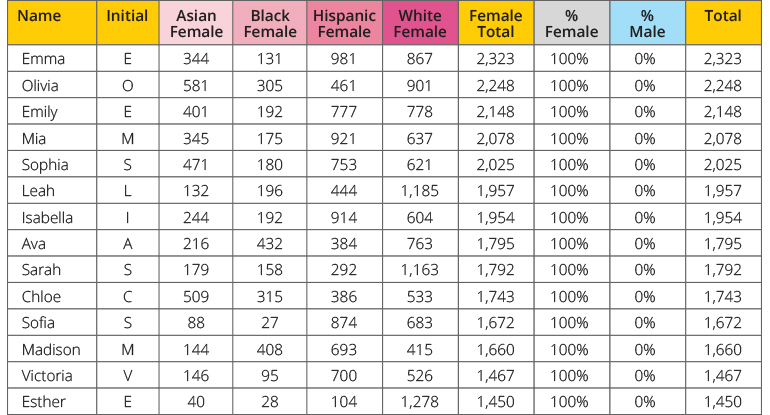 For example, we can look across ethnic groups and see that for Asian females, there is an average of 77 girls per name while White females have an average of 126 girls for each name. This means that Asian parents named their baby girls a wider variety of names than White parents. If we compare genders we see that on average, 169 girls share the same name while on average 250 boys share the same name. Based on this, it seems that parents are more open to giving female babies a unique name or spelling of a name versus male babies. Of course, there are names that were not given to a single baby in New York City between 2011-2016 (like Shelby 🙁 ). However, of the names that were given to a child in that time period, the most unique name was given to female babies across all ethnicities. The name? Aisha. 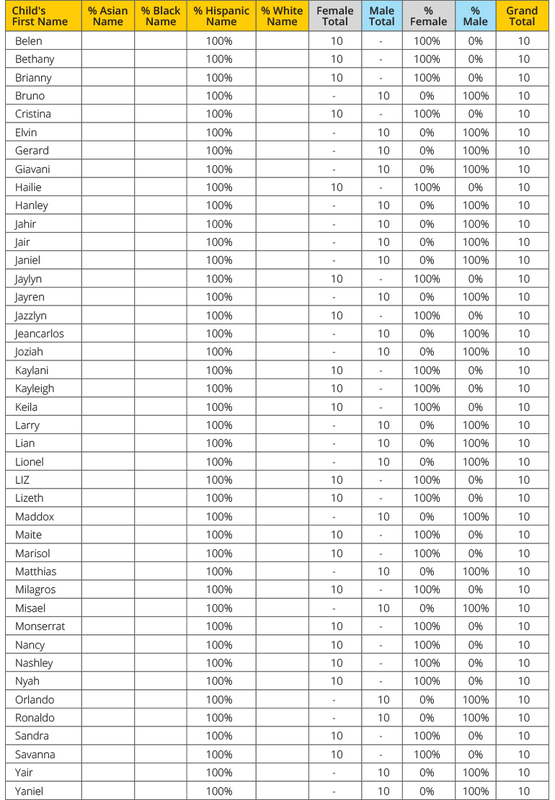 The most unique name given across all ethnicities to male babies was Aidan (with an “an” not an “en”). This may seem like a common enough name but it’s the different spelling that makes it unique here. If we break it down by ethnicity we see that the most unique Asian baby names were Jun and Abrar for boys and Ananya and Anayah for girls. The most unique Black baby names were Aissata and Amiya for girls and Alija for boys. The most unique White baby names were Anas, Alter, Amrom, and Aleksander for boys and Aleksandra for girls – spelling the latter two with the k instead of an x.
Hispanic babies were given the largest amount of unique names with 42 total unique names given. You can see the full list below. Although uniqueness in names varies between ethnic groups, something that isn’t unique are initials. According to the data, across the board, we all lean toward names that begin with A, J, E, M, or S.
If we keep in mind those unique names from above, we can see that every single one of them begins with one of the popular initials. Here’s where I finally made it to the top percentile with my first initial. Let’s look at popular names for a second. Do they also adhere to the A, J, E, M, S trend? For the top five most popular names for girls (Emma, Olivia, Emily, Mia, and Sophia) all but one name begins with a popular initial. For the top five most popular boys names (Jacob, Ethan, Matthew, David, and Liam) all but two names begin with one of the popular initials. So what does this tell us? When it comes to baby naming, New York City is, well, a bit of a melting pot. Although there is a range of unique names across both gender and ethnicity, there are some things everyone tends to lean toward – even if they’re just initials. At the end of the day though, choosing a name for your child can determine and mean a lot. It can affect how people see you, how you see yourself, and if you have to tell people you were NOT named after a car for the rest of your life. 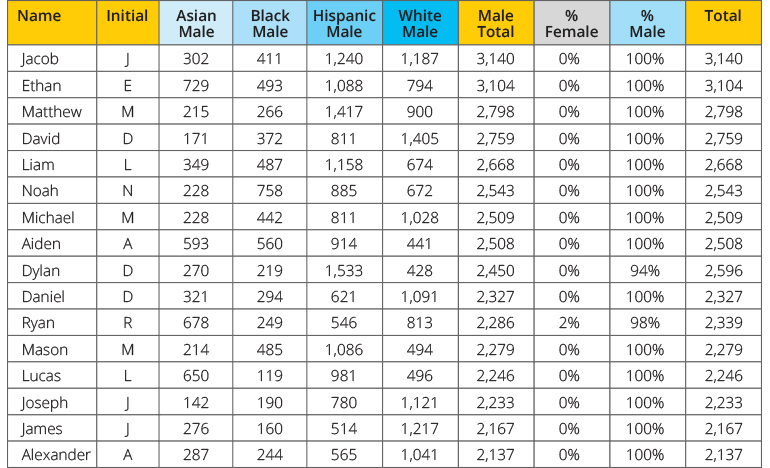 Take a deeper look at how names break down by gender and ethnicity and..